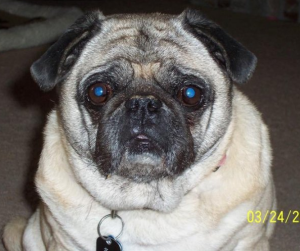 “Hi, my name is Daisy and I am a female fawn pug. I came into the rescue as an owner surrender. I missed my old family alot at first but I have now grown into my foster family and am living the good life. I just turned 9 years old last March but you would never know it. I still have a lot of energy. I enjoy chasing my step brother Bandit (a 3 year old Pug/Peke mix) around the house or backyard. I also do like to bark when I feel the need to communicate my displeasure to one of my foster siblings or foster parents. I’m pretty smart! I am a very sweet puggy girl and usually pretty laid back. I follow my foster parents everywhere and like to lie near to them and sleep. I don’t jump on furniture as I am not really a jumper. I do have some arthritis in my legs but it does not slow me down while running. I handle the stairs pretty well. I like to play with my foster brother’s toys. I love to have my ears and belly rubbed. I sleep by my foster parents’ bed and have been told I snore rather profusely but my foster dad says it is music to his ears. My health is really good. I had 5 teeth removed recently and have no problem eating. I do breathe a little heavy as is common with pugs. I weight a healthy 26 lbs. which is 2 less lbs. then when I came into the rescue. I like to take walks and am very well leash trained. I am house trained and never have bladder accidents in the house. I love to ride in the car and am very well behaved.